I have 2 craft sales coming up the end of September, and September starts next weekend. I always have more ideas than I have time for, so today I started making a list, and trying to prioritize. Lacking motivation, or the supplies to get some projects done, I struggled all day with what to do. I could waste a lot of time looking on the Internet for new ideas, but I decided that instead I would look for a challenge for my inspiration again. Today I pulled out 2 challenges and my Betsy's blossoms stamp set. 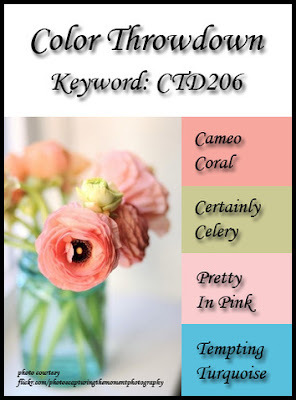 I found a beautiful color palette from Color Throwdown 206 to use Cameo Coral (I used Calypso Coral), Certainly Celery, Pretty in Pink, and Tempting Turquoise (I used Bermuda Bay). Since my plan was to make some little note card sets, and I was using 3X3" squares, I remembered that the card challenge 270 at Stamping411 was to use a square card. The big challenge was to get the layout on my tiny cards, but, I did it. My photos just don't do them justice, because it was really hard to get the pink to show. 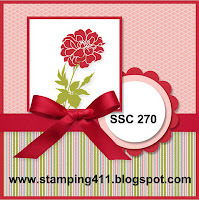 The big blossom from the stamp set, which I always call the mum, was used in 3 different ways. On one I used it for the whole square frame, the second it got punched with a Fancy Flower Punch and the third was stamped with the Blossom Bouquet Triple Layer punch. I used all the layers from the triple punch to create layering pieces behind the flowers. I did a bunch of stamping, punching and cutting to create these cards, but a lot of it was rejected, or ended up in the "to be used later" pile. I just could not have room for a bow on my layout, and hope that doesn't kick me out of the running for the challenge at Stamping 411. The basket idea is one I have been holding on to for years, and finally got around to making it. After I got all the photos done, I decided that I really need to add a bow on the handle. You may not be able to see that I actually have Calypso Coral ruffled edge ribbon on the handle, so I'll show another photo where you can see it a little bit. I just made a little open box to sandwich between 2 4" scalloped circles. When I cut them, I actually folded the paper, and made it so the fold was in about 1/2 inch from the edge of circle, so the circles are joined, and then I scored them and folded around the box. I had fun making this set, and plan to do several more in different paper and color schemes. So I sure hope somebody comes out with another fun color scheme for the next challenge. That's the end of the weekend, and time to clean up a little and get ready for a fresh start tomorrow. I have a job to do, if I am going to be ready for 2 craft sales. Hope you liked my project, and come back to see me again. I just love your card set! Beautiful! Thank you so much for joining us at Color Throwdown! This is so lovely! beautiful set of cards and that basket is a great adition to it! Very pretty card set!!! Thanks for playing along with us at Stamping 411! What a wonderful gift set! Love the variety of note cards using the throwdown colors! Thanks for playing along with us! Simply fabulous! What a great idea!